If we lived our lives in a Murakami novel we'd always be eating spaghetti, drinking Cutty Sark and having conversations with cats*. 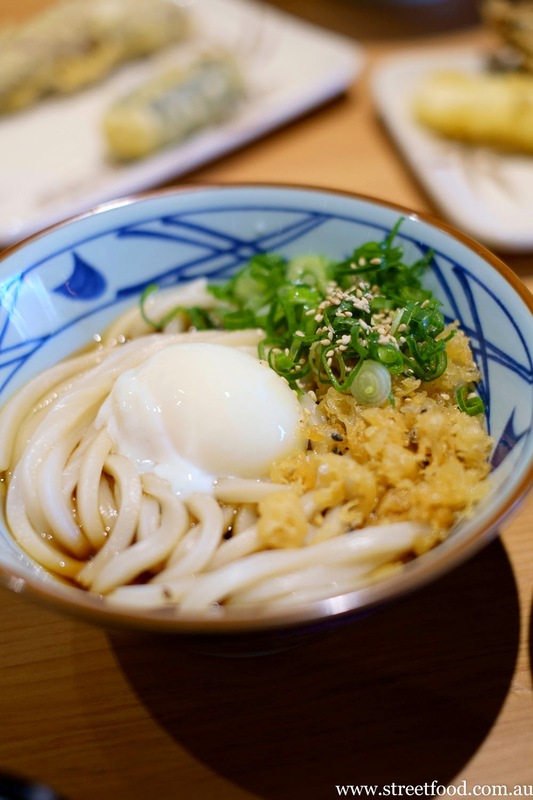 But Marukame Udon and Tempura in Chatswood brings us back to Japan in another way through its fresh house made udon noodles and onsen tamago (soft boiled eggs to you and me). Standing in the front of a large window watching bubbling noodles is our idea of a great lunchtime show. Seeing the stretching and cutting of the dough before it gets boiled up and mixed with broth and that oh so lovely soft boiled egg is one of the best parts of going to Marukame in Chatswood. 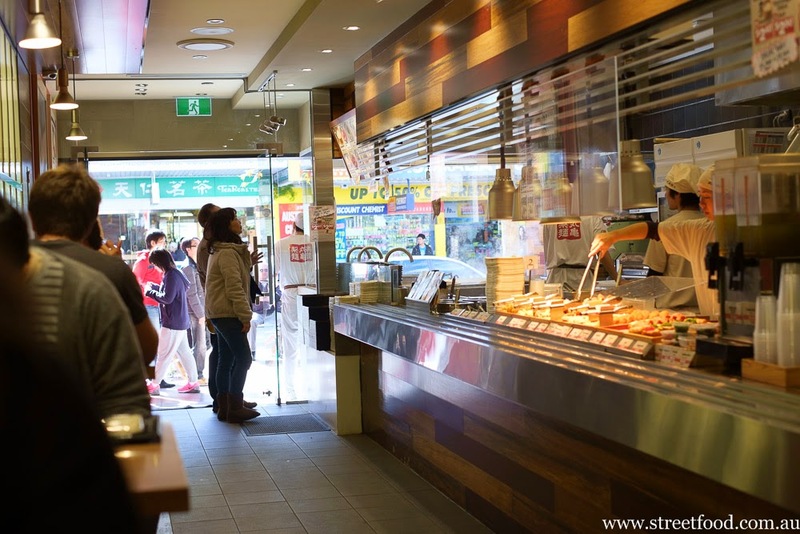 One of the easiest ways to get a good meal in Japan is to go to one of the cafeteria style noodle bars. Order your noodles hot or cold and add toppings, grab a crunchy piece of tempura and away you go. 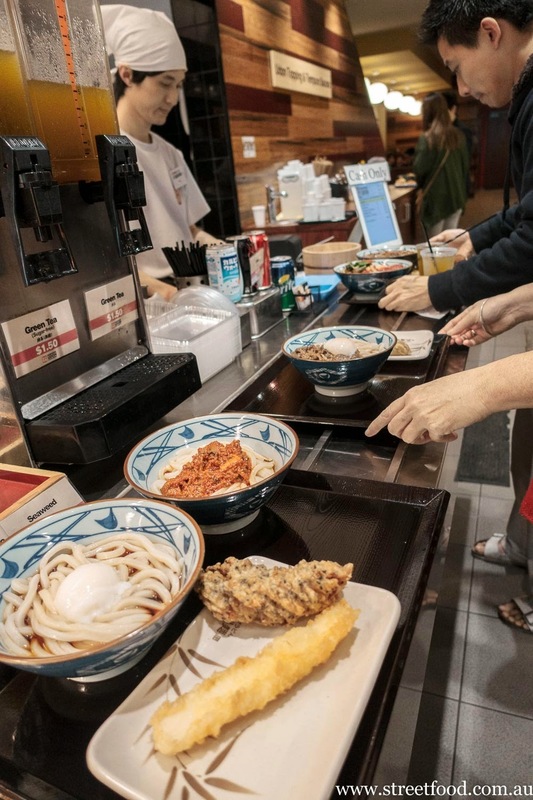 Marukame replicates this style of service here in Sydney, adding in fresh hand made udon noodles and a wide selection of flavours to add to your order. 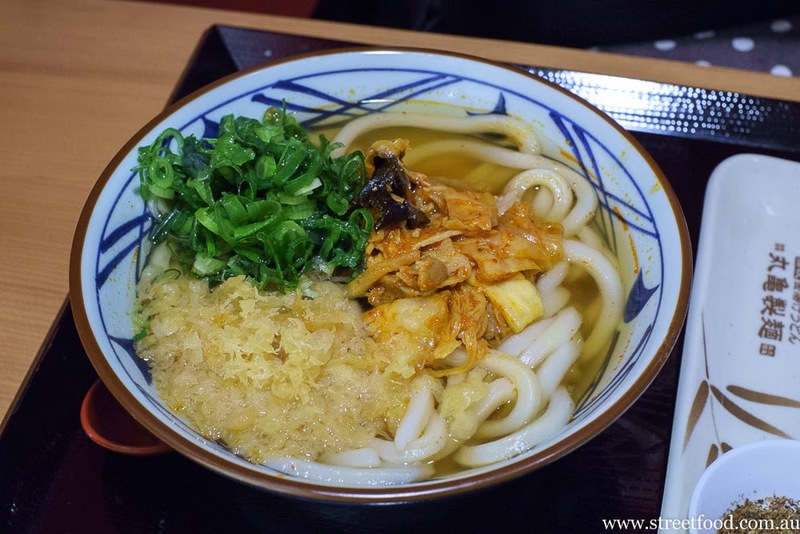 Marukame is the only udon joint in Sydney (that we know of) that makes udon fresh in house, which is commonplace in Japan. Other places use frozen noodles which taste ok but never seem to be cooked quite right, our theory is the frozen noodles lower the temperature of the cooking water. Shawn's favourite: classic cold (or hot) noodles and broth with the essential onsen tamago ($5.90 or $6.90 large). The standard soup toppings of tempura bits and sliced green onion are available on a separate counter to liberally sprinkle over, no measly 'one scoop only' policy here. There's also roasted sesame seeds in a big bowl, hot chilli sauce, vinegar and soy. 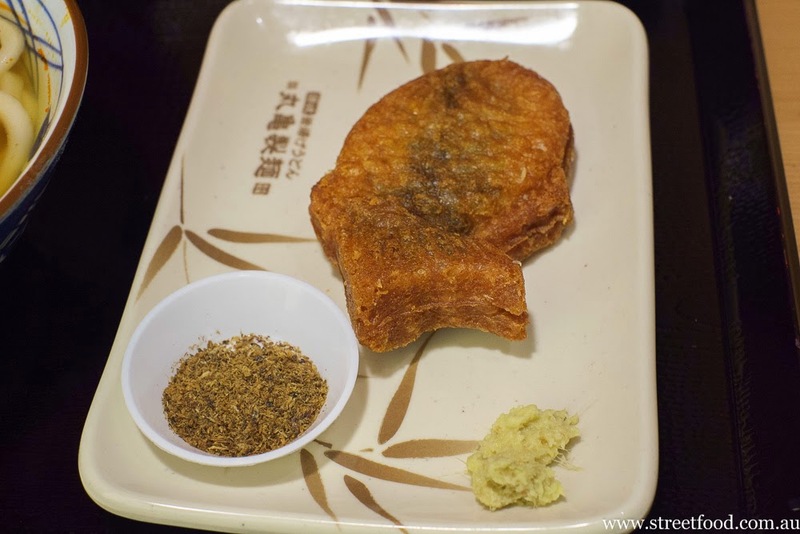 Shichimi tōgarashi (seven spice chilli powder) is on every table. 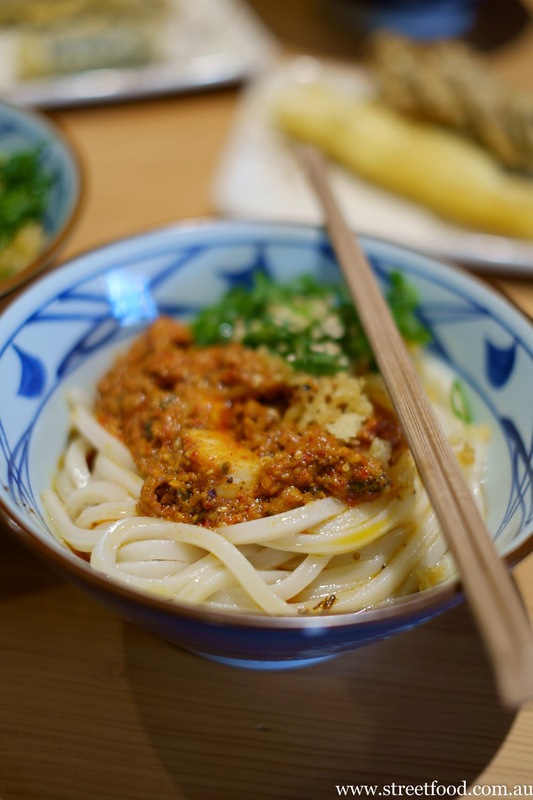 A spicy dan dan udon ($6.90, or $7.90 large). We had low expectations for this but it turned out to be a little bit sensational: the meaty mincey goo had a nice Szechuan pepper kick to it, moreso than even some Chinese restaurants we've been to lately. Alison's favourite, hot noodles and broth with a topping of stewed beef and onions ($7.90 or $8.90 large). Egg absolutely not optional. 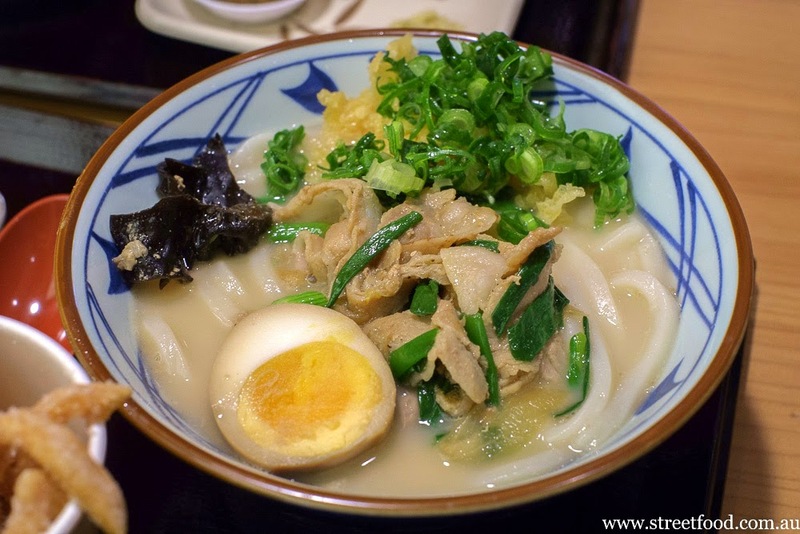 The tonkotsu udon ($7.90 or $8.90 large) met our low expectations, the broth is weak and thin, the pork is ok but we much prefer traditional salty flavours with our udon. Pork kimchi udon ($6.90 or $7.90 large) made Miss Chicken cluck with delight, udon and kimchi work well together. Crisp deep fried udon noodle twists, sweetly flavoured like cinnamon donuts, but sadly oversalted. 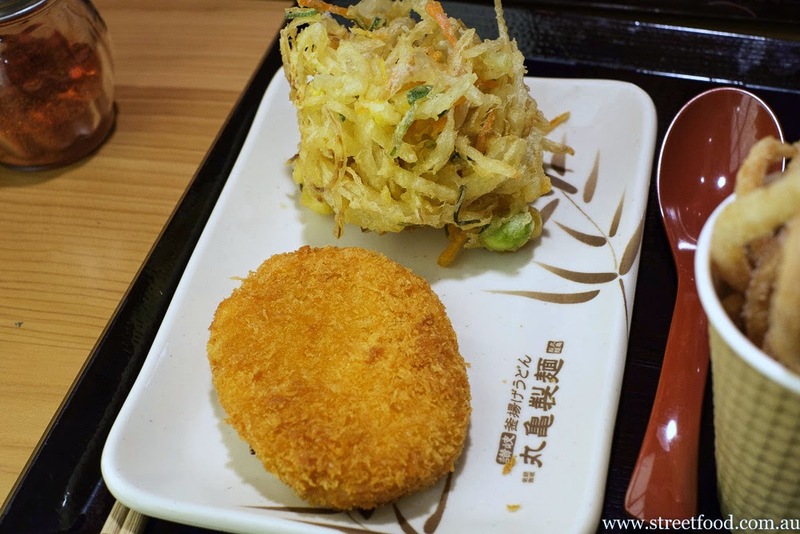 Vegetable tempura and a curry croquette. The curry croquette was fought over. 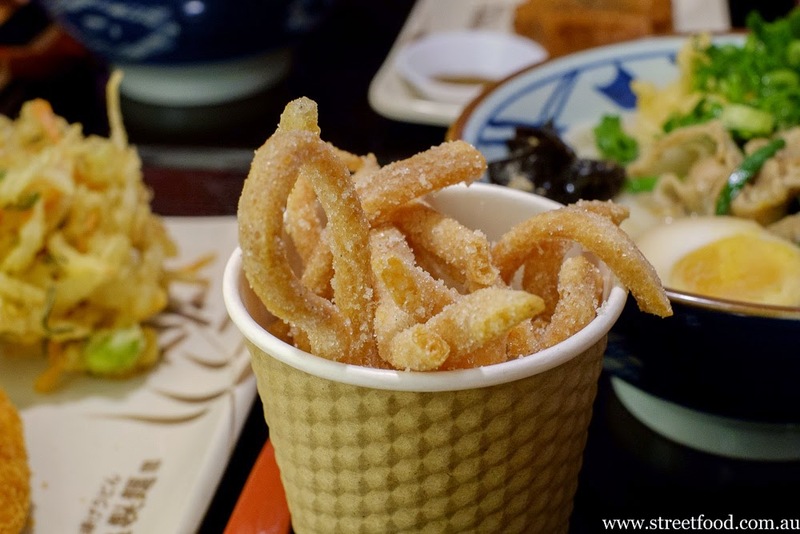 We tried a few more of the little fried snackages but it's the udon that floats our boat. 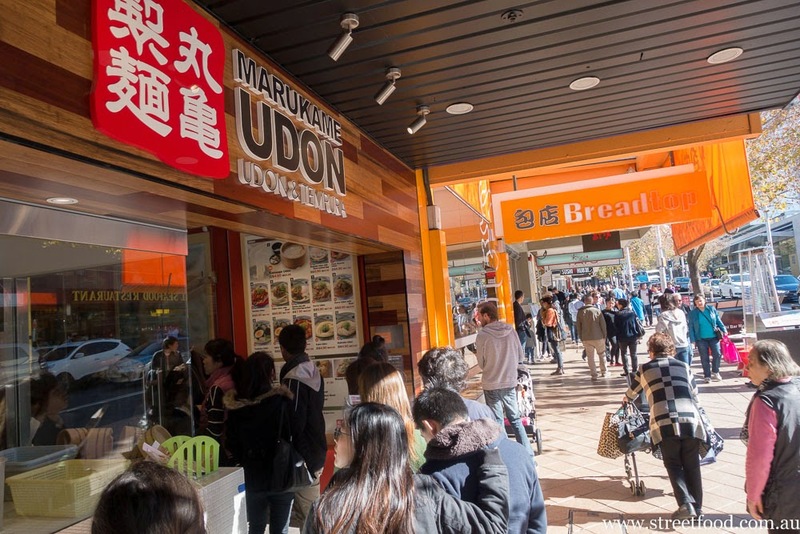 Marukame Udon is at 332 Victoria Ave, Chatswood. *Our Murakami-ish real life actually involves all three of those things. hehe i definitely agree, egg is always a must! Mmm nothing beats the taste and texture of fresh udon. 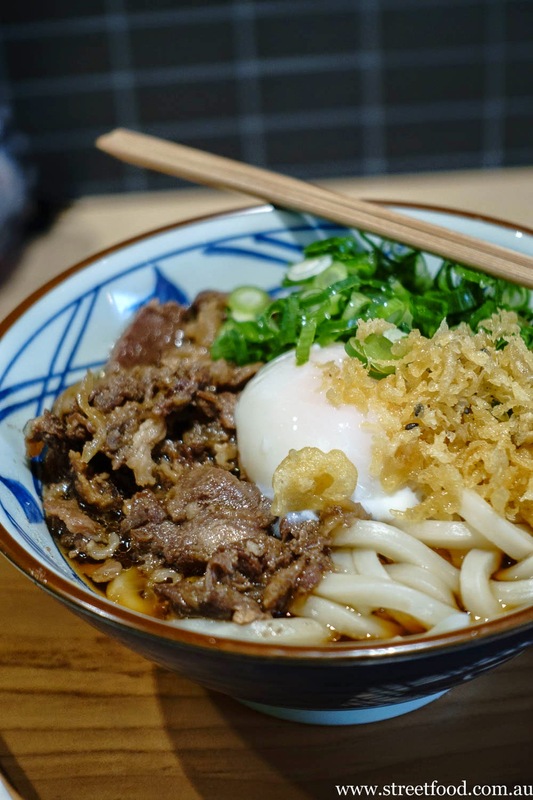 This is on my must try list - I love the sound of the stewed beef and onion udon!